Posted July 31st, 2016 by Jenna & filed under REVIEWS, Theatre. Keara Barnes moved to Ireland a while back and fell in love. And Joe had a little girl from a previous marriage. Barnes plays four people in this solo show, her Canadian self, her boyfriend Joe, his little Irish girl and the crazy Irish ex-wife. And she does this all very well. The play tells of Keara who meets Joe and moves in with him and her encounters with his ex-wife. How relations between them are strained at best and threatening at worst. She details her life with this menacing woman in her life. Her tale is honest and engaging. Barnes has you in the palm of her hand the moment she opens her mouth. She, with Micheal David Stewart as her director have crafted a little gem of a play. Her accent never slides and the audience can really get inside the pain she experiences as well as the pain of Joe’s little girl. The only disappointing part of this narrative is that it wasn’t a bit longer so you could spend more time with Barnes. 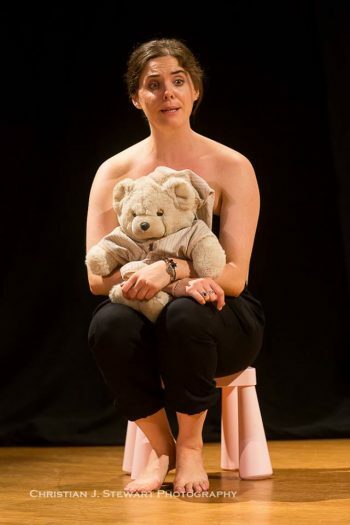 Almost a Stepmom is part of the Calgary Fringe Festival. More information is available online.